Posted on August 11, 2015 by Kyle H.
Imagine you are having a nice day in a peaceful, secluded town when suddenly the government is hauls you and your friends away to test for a biological virus that could give you, or any other teens in the whole world, super powers. This is what it is like for Aubrey Parsons, a normal girl in high school, is suddenly thrown headfirst into a battle between the U.S. government and a terrorist organization using super-teens to destroy national monuments across the country. With this information, the U.S. government uses their teens to stop these terrorists. Aubrey is highly suited for the situation having some of those powers herself. She has the ability to become unnoticed by anyone around her. Aubrey, along with some friends, eventually joins a special task force in the army that specializes in the destruction of terrorist groups and will help bring the war to an end. 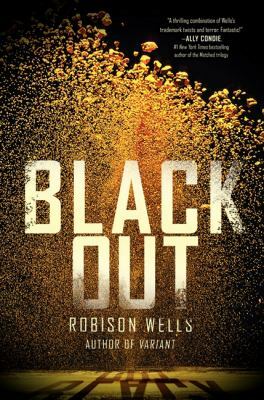 The author, Robin Wells, tells the story from the point of view of a few teens with special powers caused by the virus that go on adventures to stop, or join forces with, the terrorists. Having families back home and being abducted by the government, these kids don’t know who to trust; but they do know one thing: they will not let these terrorists continue to destroy their country and the people in it. Blackout is available for check out from the Mission Viejo Public Library.